Not only are 4K UHD projectors coming down in price but they are also getting some new features. 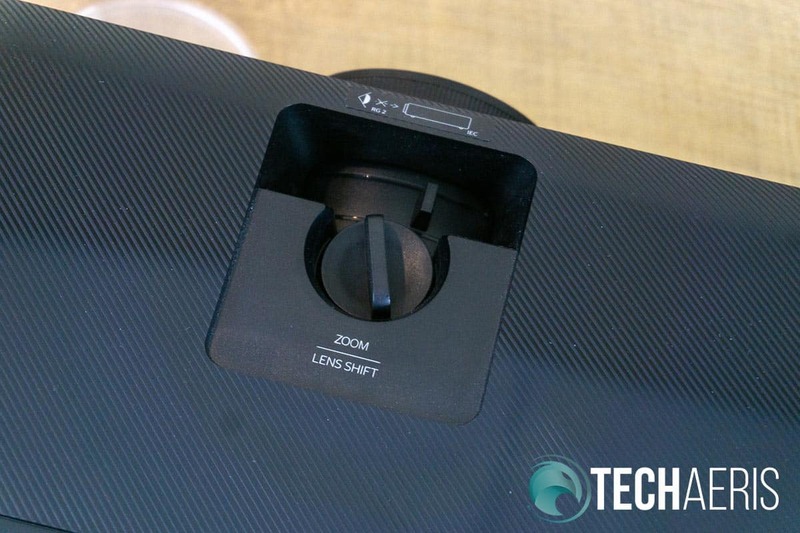 Our Optoma UHD51A review takes a look at a 4K UHD HDR home theatre projector with both Alexa and Google Home support. 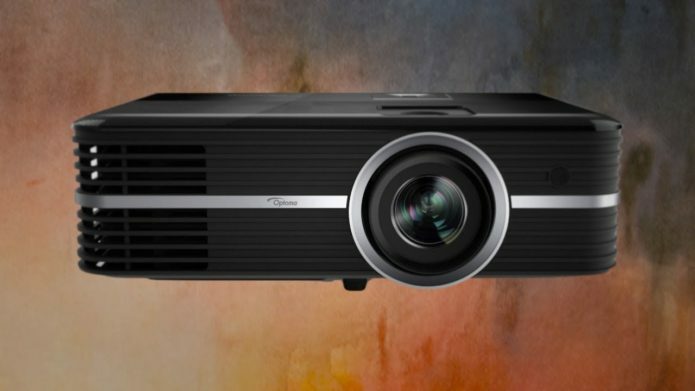 The Optoma UHD51A is pretty standard looking as far as projectors are concerned. Black in colour, it’s just over 5-inches in height, 15-inches wide, and 11-inches deep. The front of the projector houses the lens, offset to the right (when facing it), the IR receiver to the upper right of the lens, and ventilation outlet to the left. The lens features a focus ring around the outside for adjusting the picture focus. Front view of the Optoma UHD51A smart projector. The left side has more outlet vents, and the right side is where you’ll find the inlet vents. The back of the projector has the usual ports one would expect on a projector, as well as a couple others. From left to right (when looking at it) are the RJ-45 connector, RS232 connector with USB-A Alexa connector below it, HDMI 1 and HDMI 2 v2.0 connectors (both with HDCP v2.2), VGA, 12V Out, 3.5mm Audio in and Audio Out ports stacked, USB-A media port, USB wireless port, and a USB service port with S/PDIF connector underneath it. The standard power socket and Kensington lock port are located near the bottom left of the back. Back view of the Optoma UHD51A smart projector. The top of the projector is where you’ll find the control panel which is located behind the lens near the back of the top of the projector. The control pad has buttons for power, enter, menu, home, return, and four directional keys. Just below this are three LEDs for on/standby, lamp, and temperature. In front of the control panel is a second IR receiver. Just behind the lens is the Lens Shift Dial and Zoom Lever. 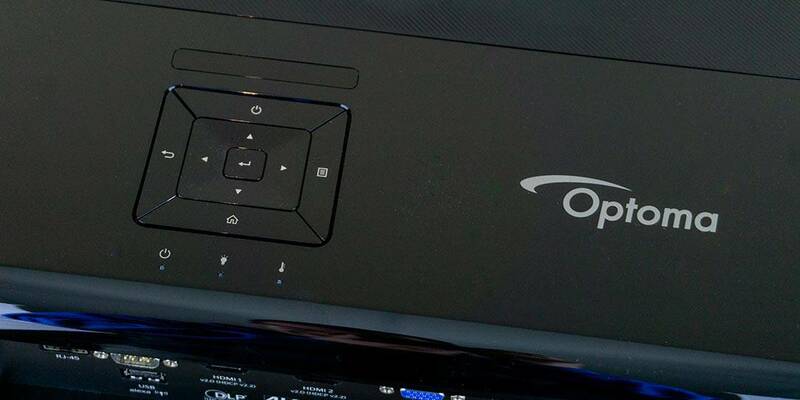 The Optoma logo is screened on the top of the projector to the right of the control pad. The top control pad, IR receiver, and indicator LEDs. Finally, the bottom of the projector features three tilt-adjustment feet, one centered in the front and two at each corner in the back. 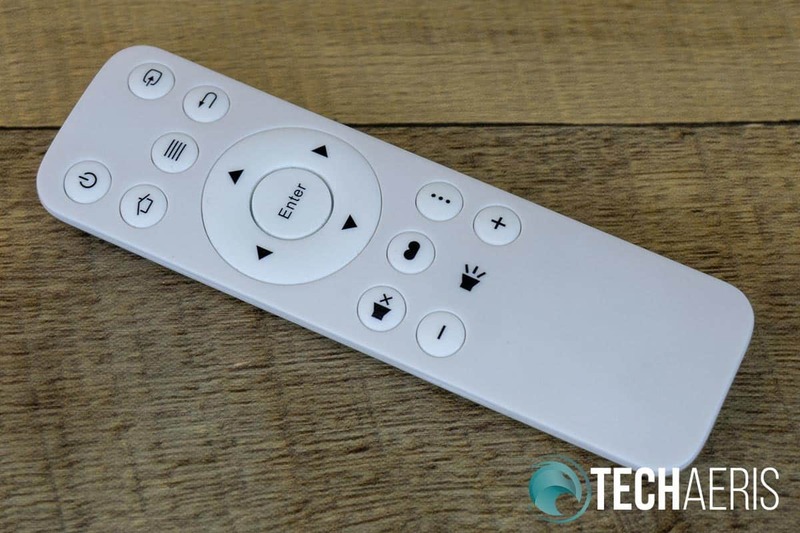 The small white remote itself is pretty standard with power, source, home, menu, back, mute, volume, display mode, option, and arrow keys/enter buttons. Setting up the projector itself was pretty straightforward. Between the tilt-adjustment feet, zoom, lens shift, and focus, it was easy to get a crisp picture on my 106-inch screen. The focus, zoom, lens shift, and tilt-alignment feet allow for fine tuning the image. If you wish to use the projector with the Alexa Skill or Google Home, there is some setup required. 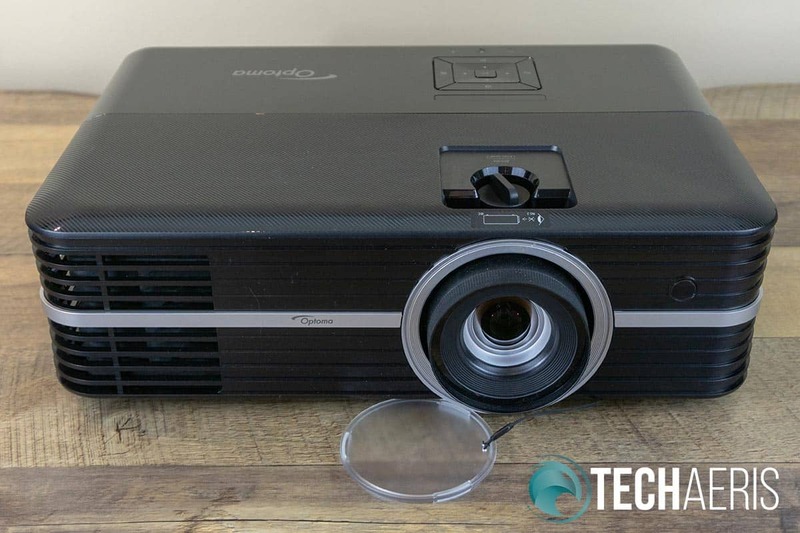 The setup is pretty easy and the Optoma SmartProjection app walks you through both in a very straightforward fashion although you do have to register an Optoma Mydevices Cloud Account. 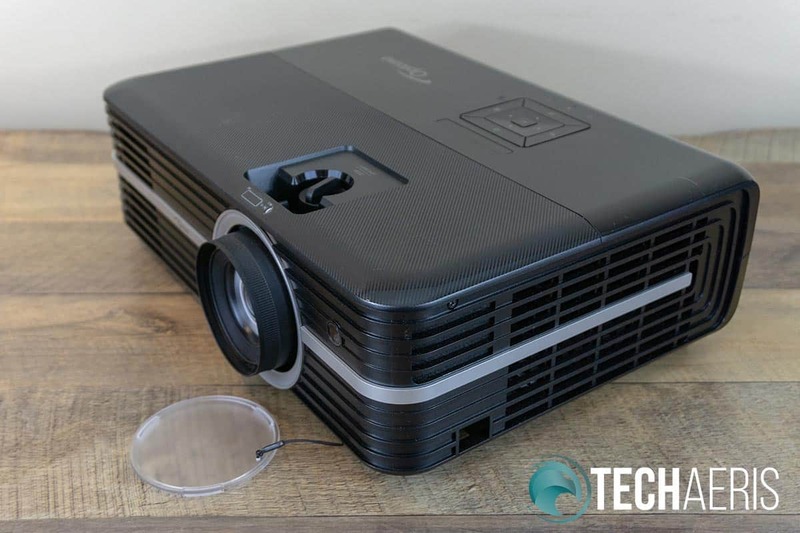 The Optoma UHD51A is the first projector we’ve tested with the new Texas Instruments 4K UHD 0.47″ DMD DLP chipset. One side effect of this chip that we noticed right away is the fact that there is an additional light bleed of around 3-4″ around the picture. Put another way, when set up with a screen with a black border, there are a couple of inches of light that goes beyond the border when the image is set up properly within the frame. When we asked Optoma about this issue, they mentioned that it is a chipset issue and not a specific issue with the projector. After extended use, it wasn’t as noticeable, but if you have OCD like me, you’ll want to ensure you have a thicker frame or a dark wall to eat this extra light. An unfortunate side affect of the new TI 0.47″ DMD chipset – shadow light bleed as is seen to the left of the black border of the screen. That aside, the 4K UHD HDR display of the Optoma UHD51A was crisp and clear when projected from a distance of 130″ throwing a 106″ image. There are plenty of customization modes to get the colour saturation and brightness that you prefer in both non-HDR and HDR formats. Overall, the Optoma UHD51A has a very nice 4K UHD picture with solid HDR when supported by the content you are consuming. 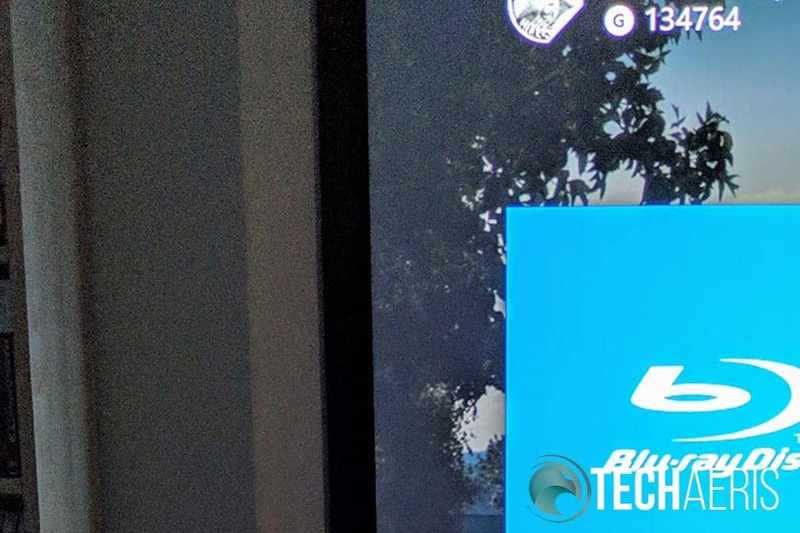 As you can see from the list above, there are more than enough colour settings and adjustments you can play with to get the display just right for your viewing environment. While the UHD51A was bright enough in our basement setup with its 2400 lumens and 500,000:1 contrast ratio, Optoma also just released a brighter version — the Optoma UHD51ALV — with 3,000 lumens for those that require more light throw. The projector itself runs on Android OS. It features a pretty simple interface with three main sections: Projector, Application, and Settings. Each category is pretty straightforward and allows you to configure the projector, access your language and network settings, and launch Wi-Fi Display, Media Player, and Alexa configuration. As far as settings go, we covered most of them above in the Display section but some others of note include being able to check Lamp Hour, Filter Usage Hour, adjust power settings, view a test pattern, set the projection mode (front, rear, front-ceiling, rear-ceiling), toggle high altitude mode, and more. The companion Optoma SmartProjection app is required to assist with setting up the UHD51A with Alexa and/or Google Home. While it initially launched with Alexa support, Google Home support was added while we had the unit for testing. The app walks you through the process nicely and after completed can be used to manage your Optoma devices as well as quickly access a list of available Alexa Skill and Google Assistant commands. To be honest, the app definitely has a very outdated look but it is simple and does what is required of it. In order to cast to the Optoma UHD51A, you’ll have to download another app called EZCast. Unfortunately, we encountered frequent stutters and long loading times when trying to cast videos or images to the projector from a Pixel 2 XL. However, you can also view content from a USB stick on the built-in media player which worked much better. The media player supports everything from MPEG to MP4 and MKV as well as JPG, PNG, MP3, WMA, AAC, PCM-WAV, and ADPCM-WAV so there’s not much it can’t play. For the business oriented, the media player can also display PDF, Word, Excel, and PowerPoint documents with some limitations. The Optoma UHD51A takes about 30 seconds or so to power up and 15-20 seconds to power off. It’s also fairly quiet and when watching movies or playing games the sound of the fan wasn’t distracting at all. The Optoma UHD51A is pretty quiet when passing air through it for cooling. The projector also does a great job of auto-switching between standard and HDR content. This was most noticeable when switching between games on the Xbox One X that were 4K HDR compatible and those that weren’t. There are a few seconds where the screen goes black while it switches over but the info panel in the upper left corner lets you know at a glance what mode it’s in. As far as the Alexa and Google Home functionality is concerned, the projector responded accordingly. There are more Google Home commands available than Alexa ones, however, so there is a definite advantage to using Google Home. With Alexa, you can use commands like “Alexa, turn on/off <projector name>” as well as changing volume, inputs, and USB Media Player playback like play, pause, stop, next, start over, and more. While both worked well enough, the added controls with Google Home make it an obvious choice between the two. As is the case with most projectors, while the two 5W speakers are acceptable in a pinch, they definitely lack any bass or much definition. 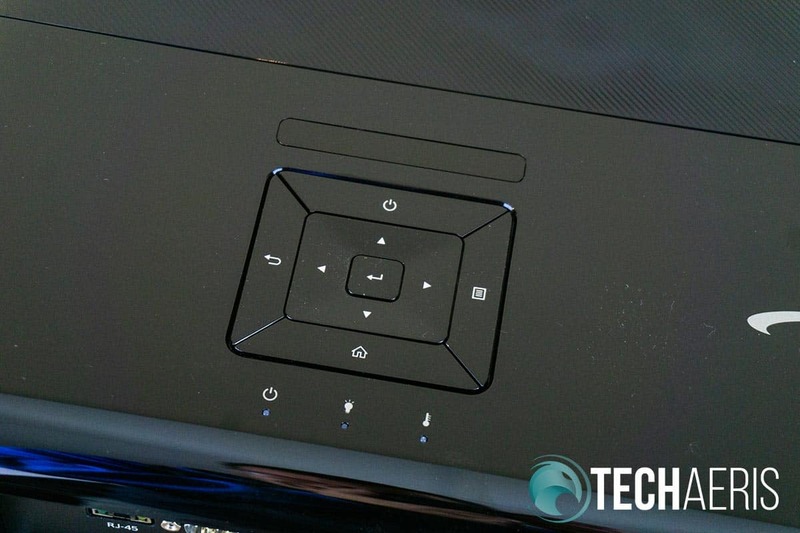 You’ll definitely want to hook this into a proper sound system for maximum enjoyment. With an MSRP of $1699.99USD, the Optoma UHD51A 4K UHD HDR smart projector is already decently priced. Toss in Alexa and Google Home support alongside a built-in media player and wireless casting support and you’ve got decent value for the price. 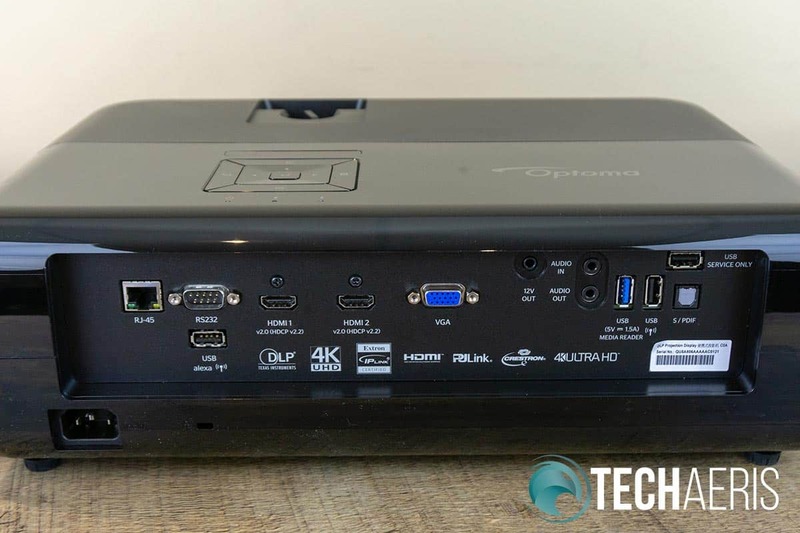 If you’re in the market for a 4K UHD HDR projector, the Optoma UHD51A will definitely do the trick and has the added bonus of voice command support and a few other features that add value.